I was as skeptical as the next guy about the new cube-shaped Macintosh. The disinformation campaign was very successful - almost everyone had a different idea of what the cube would be, assuming it actually existed. I missed the keynote, although I did see Steve Jobs on the show floor with Jonathan Ive later in the day, because I had registered as a regular person, not a member of the media. I'll know better next time. 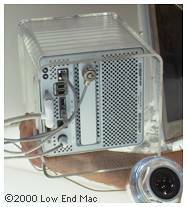 The Power Mac G4 Cube (see specs) makes almost every computer in the world seem big, measuring just 7.7" wide, 7.7" deep, and 9.8" tall. The outside of the case is clear plastic, and there's nothing in the bottom 2" or so, making it appear at first that the Cube is floating in space. It's a stunning appearance: starkly simple, elegant, and immediately desirable. The Cube has all the features of the iMac, except for the internal screen, but roars along with 450 MHz G4 power. And it won't sit alone on your desktop. The Cube comes with two spherical Harman Kardon speakers which are crystal clear, have mirrored cones, sound great, and are practically indestructible. The truncated keyboard of the past two years has been replaced with a new extended keyboard, the Apple Pro Keyboard. Sporting 108 keys, the new USB keyboard brings back the F13 through F15 keys; the lamented forward delete key; crtl, option, and cmd keys on both sides of the space bar; and full-sized arrow and function keys. To top it off, the much maligned "puck mouse" has been replaced by the innovative Apple Pro Mouse. It's still a single-button design, but you won't see a single button on the Pro Mouse. This may sound odd, but the mouse is the button. That's right, by pressing down on the front of the mouse, you click. Clever. Very clever. This is the kind of thinking different that continues to set Apple apart from the world of Wintel clones and copycats. Too keep the Cube cool, Apple uses an external power supply - something iBook and PowerBook users are already familiar with. Of course there are the video connectors (digital and VGA), two USB ports, two FireWire ports, a modem port, and a 10/100 ethernet port. All these are on the bottom of the cube; there are no wires sticking out the back. The Cube isn't for everyone: if you need more than a 450 MHz G4, PCI expansion slots, or an internal Zip drive, you'll want to look at the Power Macintosh G4 (more on that below). But if you were interested in an iMac but wanted a larger screen, the Cube could be perfect for you. The big question of the day has been value. At US$1,799, is the Cube overpriced? If not for other changes in the Power Mac line, Apple might have dropped the G4/450 to $1,599 today, replacing the G4/400 at that price point. Instead, the G4/400 sells for $1,599, the Cube for $1,799, and the G4/450 for $2,499. For $200 more than the G4/400 you get 12.5% more speed, a really stunning design, and no PCI expansion slots. With the G4/400 still available at $1,599, the Cube seems a bit overpriced. Those PCI slots can be invaluable. The option of an internal Zip drive is also very nice, as are the extra drive bays of the traditional Power Mac G4 design. While they last, I'd have a hard time recommending the Cube over the Power Macintosh G4 unless you are convinced you won't need an expansion slot. For that market, the limited internal expansion options of the Cube are not an issue, although price is. As long as the G4/400 remains available at $1,599, the compelling reason to choose the Cube is the coolness factor. That said, the Cube has more cool than you can shake a stick at. Ignoring the fact that it seems just a bit overpriced compared with the G4/400, it's an absolutely brilliant machine. Stuck between a rock and a hard place, Apple has put their best foot forward and doubled the power of the Power Mac G4 by putting a second processor in the G4/450 and G4/500 - with no change in price (see specs). Although very few applications currently support multiple processors (Photoshop being a notable exception), Apple is paving the way for OS X, which readily supports multiple processors. With the G4 seemingly stuck at 500 MHz in this age of 1 GHz Pentiums and Athlons, Apple had to do something to appear competitive on the MHz front. (Yes, we know that MHz is not an accurate reflection of computer power when looking at different CPUs, but the rest of the world sees MHz as a quick and dirty way to compare computers.) Apple can now claim computers with 900 MHz and 1 GHz performance, although we really have to wait for OS X to see that become a meaningful performance level across the board. It's too bad Apple couldn't ship a faster G4, because until OS X ships, buyers of the MP units won't see a significant difference unless they use Photoshop or one of the few other multiprocessor-enabled Mac programs on the market. 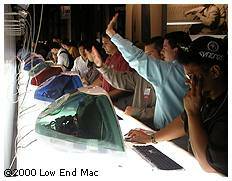 In January 1999, Apple replaced the Bondi Blue iMac with a faster model available in five different fruity colors (or flavors). Today they replaced those colors with a new palette. At the entry level is the iMac 350 (see specs), which is just like the Blueberry iMac 350, but will instead ship in Indigo, a dusky shade of blue. The base iMac will be available in September as a stunning US$799 - and that includes the new pro mouse and keyboard. The new iMac DV has almost the same specs as the current DV (see specs), but is only available in Indigo and Ruby, a remarkably rich red. My personal prediction: Ruby will be the top iMac color. It's gorgeous. One downgrade in the iMac DV, which is inexplicable considering the name, is the inclusion of a CD-ROM player instead of a DVD-ROM drive. On the other hand, that makes the iMac DV a $999 computer. Next up the line is the iMac DV+ (see specs), which comes in Indigo, Ruby, and Sage, a paler shade of green. Apple has boosted the speed to 450 MHz and given it an even larger hard drive than the iMac DV: 20 GB vs. 10 GB. At the same $1,299 price as the old 400 MHz iMac DV, the DV+ looks like a great value. Finally, Apple has made the iMac DV Special Edition really special (see specs) by making it even faster than the iMac DV+ (500 MHz), giving it an even bigger hard drive (30 GB), and offering it in the traditional Graphite or a new translucent white called Snow. At the same $1,499 price tag as the 400 MHz iMac DV Special Edition, this looks like a real winner. The new Apple Pro Mouse and Apple Pro Keyboard will be available from the Apple Store for US$59, and through Apple dealers in September. The keyboard should provide serious competition for third-party products among those who have Apple's older USB keyboard. Apple has a new 17" monitor with a flat screen. It's as transparent as the Cube's outer casing and speakers. Whether Apple can sell a $499 17" CRT against a host of less expensive models remains to be seen. If they do sell it, it will be primarily for looks, not value. The 22" Cinema Display has been joined with a 15" 1024 x 768 pixel sibling. This offers a comparable display to the PowerBook for desktop users and shares the Cinema Display's graphite and transparent styling. Speaking of PowerBooks, the PowerBook and iBook lines remain exactly as they were. Tomorrow: a look at new non-Apple products.